New England Patriots owner Robert Kraft now says he wants his misdemeanor solicitation of prostitution charge tried by a jury, not a judge. "The offer of a deferred prosecution agreement with several conditions to first time offenders is standard in cases like this," State Attorney Dave Aronberg said in a tweet. Those who would concede that they would have been found guilty would also be ordered to pay $5,000 per count. In return, the charges of misdemeanor soliciting prostitution would be dropped. A spokesman for the Palm Beach County State Attorney's Office said none have accepted so far. 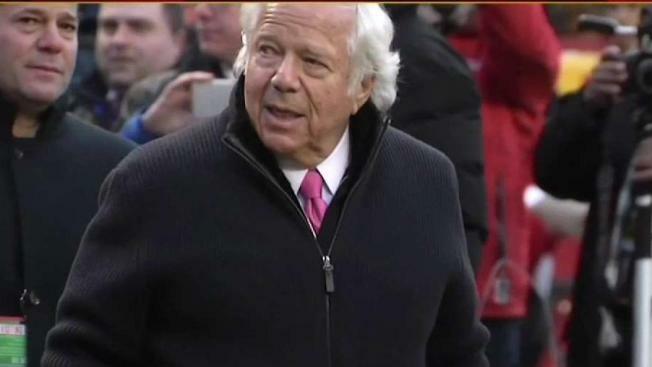 Kraft's attorneys requested a trial by jury Tuesday. "His image, his brand, is more important than anything, so it's worth spending large amounts of money to defend," said Coyne. "Normal people would not be spending this type of money on this type of case." During his press conference at the NFL owners meetings in Phoenix, Ariz. on Tuesday night, NFL Commissioner Roger Goodell addressed how the NFL will approach the Kraft case. "As I think we said several weeks ago, the personal conduct policy applies to everybody -- commissioners, owners, executives, players, coaches -- and it will be applied to everybody," said Goodell. "But it will be done after we get all the facts, we have all the information, and we'll be fair and smart about it. And that's what we'll do." Goodell was asked about a potential punishment for Kraft, and whether he would be the one to discipline the Patriots owner. "When we get all the information, we'll make determinations. I'm not going to speculate on where we are or my views on anything. Until we get all the information, we're not to make any discussions or any comments about that. The personal conduct policy is my responsibility." Over the weekend, Kraft issued his first statement since being charged.